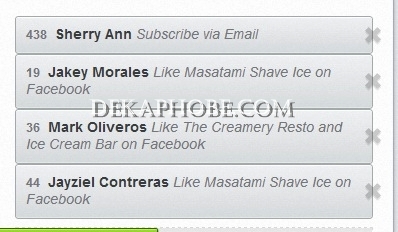 [i am a dekaphobic]: The Winners of 2nd Anniversary Giveaway #3: Masatami Shave Ice! The Winners of 2nd Anniversary Giveaway #3: Masatami Shave Ice! Again, thank you so much for joining my series of giveaways. I really appreciate it. Congratulations Sherry Ann and Jakey Morales! You each won Php 500 worth of GCs! Mark Oliveros and Jayziel Contreras! You each won Php 250 worth of GCs! You may use the GCs at all Masatami branches: Robinson's Place Manila, Robinson's Magnolia and SM Mall of Asia. Awesomesauce! This has been the first blog contents I've joined, and the first prize I won. Thanks again and keep it up!